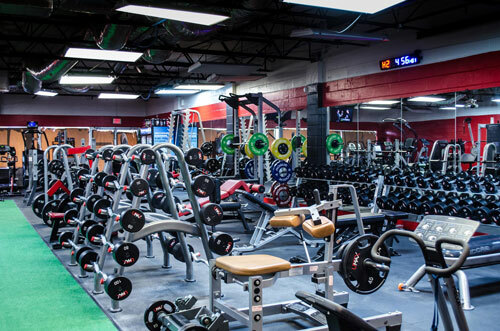 Optimum Gym South Tampa offers a vast amount of variety in free weights, machines and Cardio equipment ! If you are serious about your training we have U-MAX 2.5LB t0 45lbs rubberized olympic plates, 10lbs to 55lbs Rogue Competition Bumper Plates, 20lbs to 110lbs U-MAX straight and EZ curls bars, U-MAX 5lbs to 100lbs Dumbbells, 2.5 lbs to 25lbs beauty bells and 10lbs to 50lbs Dynabells! We also offer especiallized equipment such as: deadlift bars, cambered bar, Torque Fitness squat racks a Rogue box jump, reverse hyperextension, grip machine, NAUTILUS 4 way neck machine, Power Rack and accessories like chains, bands, chest power boards, Battle ropes and Jump Boxes. Kettlebells and Competition Kettlebells up to 110lbs are available next to our dumbbell racks. We have a dual stack Paramount Dual Cable cross trainer and a Matrix functional trainer. If you are into cardio, you can choose from our variety of cardio machines! Our Cardio area has 55″ flat screens TV’s and We feature quality equipment like Stairmaster, Cybex treadmills, Lifefitness steppers. Precor AMT’s, life fitness elipticals, Concept 2 cardio rower, Cybex Arc Trainers, and Life Fitness recumbent, upright bikes and a Keiser Professional Spinning bike. Our weight training room has some of the most variety of equipment of any gym in Tampa as well as 75″ flat Screen TV’s. We pride ourselves by being one if the best equipped gyms in the area not just by having quantity but quality as well. You will find equipment you have never seen at any other gym before and our staff is available for any questions you might have.